Baby Scrapbook Kits, Vintage Postcard Kits, & Creative Card Making Kit for Beginners! You'll find a new selection of kits in the Scrapbook & Card Kits section of the store! Baby Scrapbook Kits from K&Company, Vintage Postcard Kits from Crafty Secrets, and a complete Card Making Kit for Beginners from Klutz! The Little House Baby Boy Scrapbook Kit is a 12" x 12" album kit from K&Co. This complete scrapbook kit includes all of the components you need to create a beautiful keepsake baby album. The front cover of the album features a classic argyle pattern, small polka dots, and 2 window frame cut-outs for personalization. 10 top-loading page protectors are preloaded and ready for your completed scrapbook pages! The post-bound album makes it easy to add additional pages to your album. This boxed scrapbook kit also contains the materials you need to create perfectly coordinated scrapbook pages, including designer papers and a generous assortment of embellishment stickers. The Little House Baby Girl Scrapbook Kit is also available in the store! 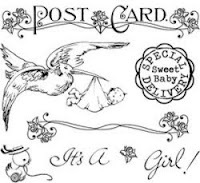 The Baby Girl Vintage Postcard Kit is a creative paper craft kit from Crafty Secrets. This vintage card making kit includes 1 custom Clear Art Stamp set, 6 large images, 12 smaller image embellishments, and 18 ivory chipboard pieces. The stamp set includes 8 separate clear stamps (see image below). You'll need a clear stamp acrylic block and an ink pad to use these stamps. If you don't have these items, be sure to check back, we'll be carrying them very soon and you'll be able to easily add them to your order. There are enough materials in this kit to make 6 vintage postcards or to create a variety of paper craft projects. Use to make decorative displays, ornaments, garlands, scrapbooks, and other creative keepsakes. The Baby Boy Vintage Postcard Kit is also available in the store! The baby boy kit has it's own unique stamp set & images. Add a splash of color to your stamped images by using colorful dye inkpads or use colored marking pens to draw inside the stamped outlines. There really are no rules with these kits. The key is to use your imagination & have some fun! There's also a Kitchen Mail Vintage Postcard Kit for you to create fun retro style mail art cards for family & friends. Or, use the materials to create a mini recipe scrapbook of your family's very best food dishes. Personalize with photos and other embellishments. Great for gift giving! You'll need general paper craft supplies on hand to complete your scrapbook and card making projects. Basic Paper Craft Supplies, including adhesives & scissors, are readily available online or at your local craft supply store. It's important to purchase photo & archival safe products, specifically formulated to preserve your memories throughout the years. 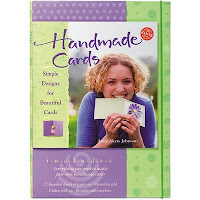 The Handmade Cards Book & Kit from Klutz is a complete card making kit for beginners. The 57-page card making book includes clear instructions for making a variety of card & envelope projects. The beautiful color photographs, shown throughout the book, will inspire your creativity! This kit also includes the materials you need to make all of the projects in the book. Includes 22 sheets of paper, a measuring grid, folding tool, and reusable card templates. If you've been wanting to learn how to make your own greeting cards, then this is the perfect kit for you. You'll have everything you need to get started with confidence! Simple designs for beautiful cards. Nicely packaged for gift giving. Visit the Scrapbook & Card Kits section to see our complete selection of scrapbook & card making kits for beginners and experienced paper crafters. Pre-coordinated kits make it convenient, easy, and fun to get started on your next creative craft project. Weekend Kits will be adding all new kits across every craft category in 2010. Explore our completely unique collection of creative project kits and be ready to start crafting on your next Weekend at Home! You'll find a new selection of beginner crochet kits in the Knit & Crochet Kits section of the store. Even if you've never picked up a crochet hook before, you can get started crocheting with one of these easy crochet kits for beginners! The Fiesta Scarf Crochet Kit is a Simply Scarves beginner crochet kit from Lion Brand. 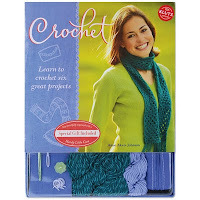 This all-in-one crochet kit includes everything you need to make a scarf, including a ball of yarn, crochet hook, chunky yarn needle, and step-by-step beginner crochet instructions. 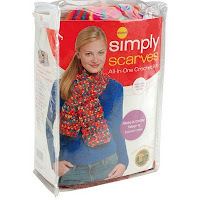 The yarn, from Lion Brand's Jiffy Thick & Quick line, is a super bulky weight 100% acrylic yarn that works up quickly. The Rocky Mountains yarn color features rich tones of of red, sunrise gold, orange, cerise and turquoise. This is an easy crochet kit for beginners to learn to crochet a scarf. Your finished scarf will be approx. 5-1/2" wide by 39-1/2" long. The scarf pattern and crochet hook included in the kit can be used again to make additional scarves - all you need is more yarn! The Beginner Crochet Book & Kit is a quality crochet kit from Klutz, a well known & trusted brand name. Kit includes a beginner crochet book, double knit weight yarn, lightweight yarn, button, crochet hook, yarn needle, and stitch markers. The yarn colors are lovely shades of periwinkle and teal. The beginner crochet book included with this kit is amazing! There are 86 pages of clear instructions and detailed illustrations, showing basic crochet techniques. You'll also find step-by-step tutorials for completing 6 creative crochet projects. Beautiful color photographs are shown throughout the book. The reviews for this crochet book have been stellar, with reviewers commenting unanimously about the quality of instruction in this book. An ideal crochet kit for all ages to learn how to crochet! 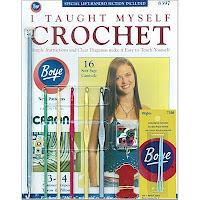 The Beginner Crochet Kit from Boye includes the popular "I Taught Myself to Crochet" softcover book, a variety of crochet hooks, yarn needles, stitch marker rings, and yarn bobbins. All you need is a ball of worsted weight practice yarn to get started crocheting! The book provides simple instructions and clear diagrams for teaching yourself how to crochet. You'll be guided through 11 crochet lessons, including instructions for learning the chain stitch, slip stitch, 4 basic crochet stitches, finishing techniques, and more. Includes a special section for left-handed crocheters. After completing the crochet lessons, you'll be ready to start your first crochet project. A variety of easy crochet patterns are included in the book, including projects to crochet a set of coasters, an easy crochet bag, scarf, poncho, camisole, blanket, cell phone case, and more! The Lion Brand website offers an excellent Learn to Crochet tutorial for beginners. You'll find both written and video instructions to help you get started. The written instructions can be easily downloaded and printed to have as a ready reference while learning to crochet. Crocheting is a creative and relaxing needle craft activity. Visit the Knit & Crochet Kits section to see our complete selection of crochet kits for beginners. Weekend Kits offers a unique selection of creative project kits across a variety of craft categories. Visit today and be ready to learn a new skill on your next Weekend at Home! DIY Jewelry Kits - Make Beaded Jewelry at Home! We have a new selection of jewelry making kits to share with you today. They're beaded jewelry kits from Cousin Corporation of America, a well known and trusted brand name within the jewelry craft industry. You'll find them in the Jewelry Kits section of the store! Impressions kits, from Cousin's Beyond Beautiful line of jewelry kits, feature creative jewelry design patterns and materials for making perfectly coordinated jewelry pieces at home. 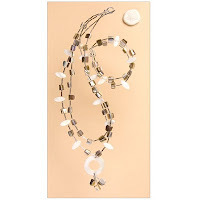 The Sea Side Jewelry Making Kit is an Impressions jewelry design kit with all of the materials you need to make this beautiful shell-inspired necklace with matching bracelet. Kit includes beads, beading wire, and findings to make 1 necklace and 1 bracelet. Basic techniques and instructions for creating the pictured jewelry pieces are provided. It's never been easier to make your own beaded jewelry at home! Impressions jewelry kits are ideal for beginners and experienced jewelry crafters looking for creative DIY jewelry project ideas. 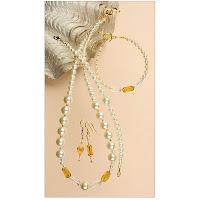 The Timeless Treasures Jewelry Kit is an Impressions jewelry design kit with all of the materials you need to make this elegant pearl & amber inspired necklace with matching bracelets and earrings. Kit includes beads, beading wire, and findings to make 1 necklace, 2 bracelets, and 1 set of earrings. If you're new to jewelry making, you only need to learn some basic techniques to get started. You'll also need the 3 basic jewelry making tools to complete the jewelry pieces in the Impressions jewelry kits - wire cutters, round nose pliers, and flat nose pliers. 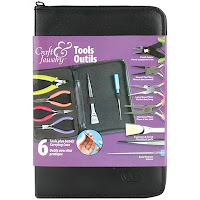 The Jewelry Making Tool Kit & Carry Case from Cousin is a basic jewelry tool kit for beginners. Everything you need to get started, all in one convenient kit. Set includes 6 jewelry making tools, including round nose pliers, flat nose pliers, long nose pliers, flush cutters, tweezers/scoop tool, and a bead reamer. The zippered carrying case keeps your tools organized and ready to take along for crafting on the go! Visit the Cousin website for creative jewelry project ideas and inspiration. Click on the Gallery link to find free jewelry projects with patterns and instructions that are easy to download & print. 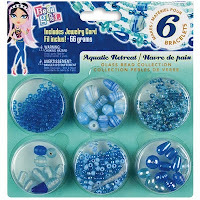 The Aquatic Retreat Bead Girl Jewelry Kit includes enough real glass beads and jewelry cord to make 6 bracelets. Beads can also be used to make necklaces and anklets. Bead Girl jewelry kits include a variety of bead shapes, sizes, and colors, all designed to coordinate perfectly together. Beads are packaged in resealable bead bins for easy storage. This is a fun bracelet making kit for kids and teens. Other glass bead collections include Tropical Bliss, Beachy Keen, Pink Paradise, Fairyland, and Flowers in Bloom. Making jewelry is a fun group activity and kits make it easy to plan a beading party! See our complete selection of jewelry making kits in the Jewelry Kits section. Learn a new craft in 2010! Weekend Kits offers a unique selection of creative project kits for beginners and experienced crafters. Stop by today and be ready to learn & create something new on your next Weekend at Home!